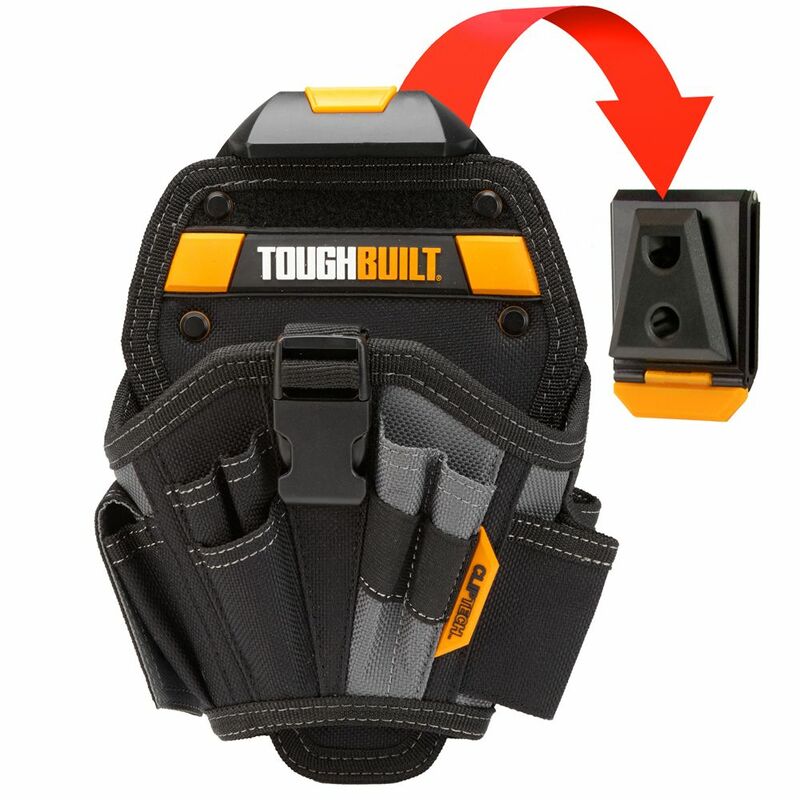 The ToughBuilt Drill Holster (Large) transforms how professionals carry their drill. The patented ClipTech Hub allows the holster to clip on and off any belt so it is carried only when it is needed or when it is the only thing you need. This pouch has 13 pockets and loops, including 2 screw driver loops, covered accessory pocket, 7 drill bit pockets and carabiner attachments loops. Works great alone for both left and right-handed use, or enhances any toolbelt. With rugged construction and heavy-duty rivet reinforcement this reliable holster withstands the most rigorous working conditions. Drill Holster Large The ToughBuilt Drill Holster (Large) transforms how professionals carry their drill. The patented ClipTech Hub allows the holster to clip on and off any belt so it is carried only when it is needed or when it is the only thing you need. This pouch has 13 pockets and loops, including 2 screw driver loops, covered accessory pocket, 7 drill bit pockets and carabiner attachments loops. Works great alone for both left and right-handed use, or enhances any toolbelt. With rugged construction and heavy-duty rivet reinforcement this reliable holster withstands the most rigorous working conditions. Drill Holster Large is rated 4.8 out of 5 by 12. Rated 4 out of 5 by VBK22 from Handy The holster works well as a part of the overall system. It is easy to put on and take off the belt, and is great to have around when working on different projects around the house that doesn't always require the drill. The quality and construction of the holster is good - steams are stitched or glued down securely. I'm not sure how it will hold up in professional settings, but is sufficiently built for large household projects. The holster fit both my large 18V hammer drill and my small 12V driver. The buckle which holds works well holding the drill in place, but the drills are usually secure enough that I don't use it. When I'm not using the buckle, it doest stay on the velcro pad very well and dangles loose in the pouch, sometimes getting in the way. The holster has a couple of slots for bits, but they're hard to access with gloves on. I use the holster often in combination with the project pouch which gives me a place for odds and ends I need when working in an area without a proper work surface.